Can you believe these JELL-O Homemade Pudding Pops are a Healthy Living dessert recipe? 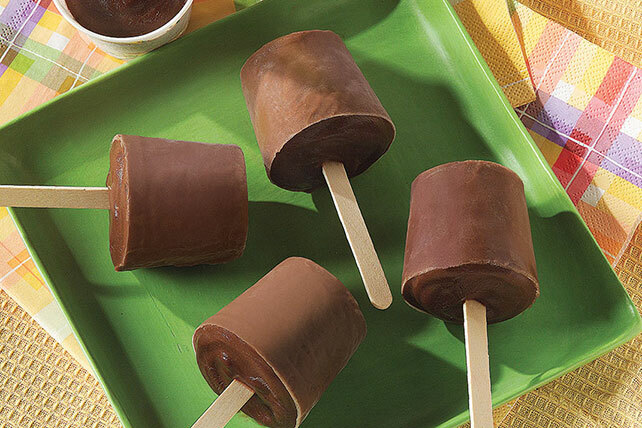 Try these homemade pudding pops for a creamy, refreshing treat. Pour into 6 (5-oz.) paper or plastic cups. Insert wooden pop stick or plastic spoon into center of each cup. Freeze 5 hours or until firm. Peel off paper cups before serving frozen pops. Prepare as directed, stirring any of the following ingredients into pudding before pouring into cups: 1/2 cup chopped or mashed fruit, or 1/4 cup chopped PLANTERS Peanuts. Prepare 2 pkg. (4-serving size each) JELL-O Instant Pudding, any two flavors, as directed on package for pudding. Spoon one of the pudding flavors into 12 (5-oz.) paper or plastic cups, adding about 1/4 cup pudding to each cup. Top with remaining pudding. Freeze as directed. Makes 12 servings.